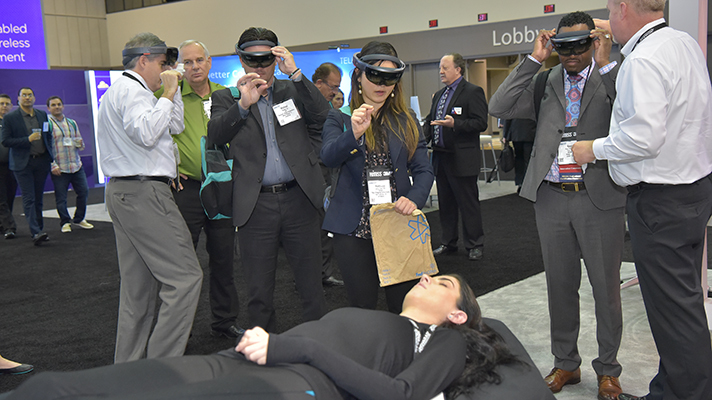 For HIMSS19 attendees interested in new and emerging technologies for healthcare, this year’s Global Conference includes a new exhibit called Debut Square. During the course of HIMSS19, Debut Square will feature sessions, pitch competitions, hands-on demonstrations, product launches and presentations by innovators and startups in the form of Market Debuts, NursePitch and the HIMSS Winner Circle. Market Debuts, for its part, runs all day Tuesday and Wednesday morning, while NursePitch is slated for Tuesday afternoon and HIMSS Winner Circle is on Thursday morning. "Market Debuts will take place within Debut Square," said Elli Riley, senior director of exhibits and meeting services at HIMSS. "This area will be filled with new product and service launches all day Tuesday and Wednesday morning." The emerging technologies will include advanced payment processes and population health, among others, Riley added. At 11:15-11:35 a.m. on Tuesday, February 12, Scott Godbout, manager of Oncology, surgical services and critical care at Meditech, will discuss the company’s Expanse Population Health suite for care management and analytics. Godbout will also discuss how healthcare providers can advance population health efforts and clinical decision making with data from Arcadia.io. Following, Godbout, Rectangle Health CTO Michael Peluso, in Healthcare commerce as a user-friendly experience, will discuss automated payment processing to give patients more options to pay and, in so doing, boost the hospital revenue cycle. Those are just two examples of what can be found in the Market Debuts area. NursePitch, on Tuesday, from 1:30-4 p.m., will feature nurse innovators and nurse entrepreneurs. The collaboration between HIMSS and the American Nurses Association, is a pre-seed and Series A funding competition intended to raise the profile of nurses in digital health. The HIMSS Winner Circle, on Thursday, February 14, from 9:45 a.m.- 3 p.m., is led by Health 2.0, Healthbox, HIMSS Asia Pac Innovation, HIMSS Innovation Community, HIMSS Innovation & Conference Center and the PCHAlliance. Interested attendees can meet the architects of the Medical Capital Innovation Competition, Open Division and the Collegiate winners. The winners will share advice about how they use tech to solve problem. Debut Square will be located in Lobby E.